The aquatic caddis fly begins its life in a larval stage, and must build an artificial carapace in order to survive into adulthood. When artist Hubert Dupras discovered that they build these cases out of whatever materials are at hand — including sticks and rocks — he had a strange idea. 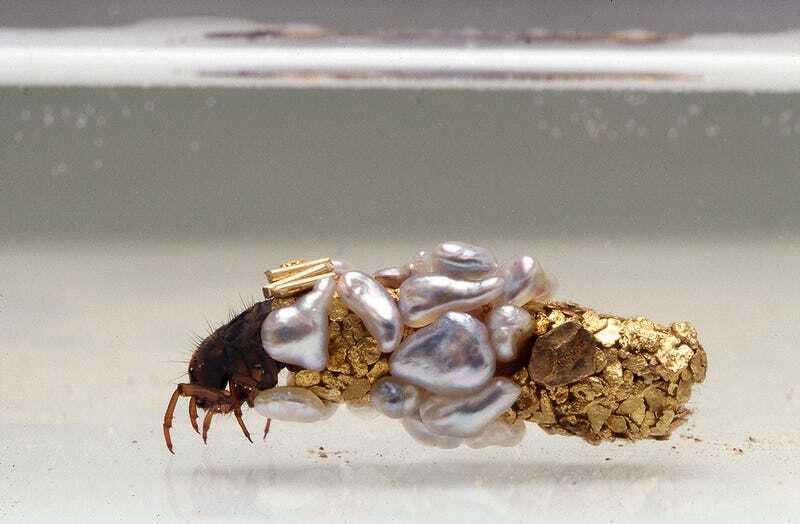 Over a decade ago, he wondered what the results would be if the caddis flies were given pearls and gold flakes to build with. It turned out that the flies thought this was just fine. They use their saliva to stick the building blocks of their cases together, and it hardens into a strong mortar. They live inside these shell-like cases for several weeks before leaving them behind as adults. The results were part-science, part-art. Dupras had discovered that indeed the flies would build out of almost any material. Plus, he had organic, lovely sculptures once the adult flies emerged from their creations. It begs the question whether this is a form of biological engineering. The bugs wouldn't naturally build cases in this way. 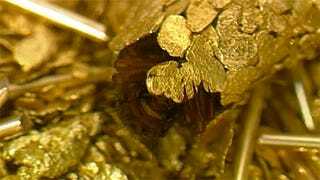 Dupras has coopted a natural, biological process to create jewelry. And yet no flies are harmed, and the humans who enjoy these jems made of bug spit are celebrating nature as much as anything else.